Want picture-perfect hair on your special day? Slip this pretty comb into the back of your ponytail or use it to hold your hair away from your face. 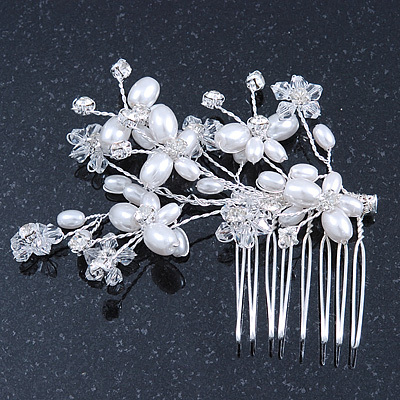 Featuring a rhodium plated hair comb decorated with a cluster of pearl butterfly's and transparent crystal bead flowers. The front part measures approx. 80mm across and is 70mm long. The metal comb is about 30mm x35mm.